High Quality Content by WIKIPEDIA articles! 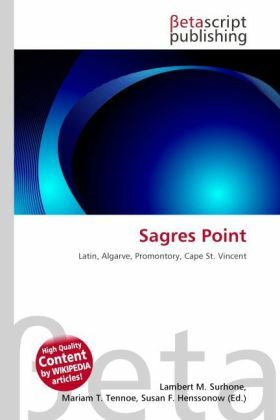 The Sagres Point , Ponta de Sagres, from the Latin Promontorium Sacrum or Holy Promontory), is a windswept shelf-like promontory located in southwest Algarve region of southern Portugal. Only 4 km to the west and 3 km to the north lies Cape St. Vincent (Portuguese: Cabo de São Vicente) which is usually taken as the southwesternmost tip of Europe. The vicinity of Sagres Point and Cape St. Vincent has been used for religious purposes since Neolithic times, to which standing menhirs near Vila do Bispo, a few miles from both points, attest.